Many people wonder why economists seem unable to ever successfully predict anything. Managing editor David Donovan says the reason is simple: it's because economics is an art — not a science. "Economics is the only field in which two people can get a Nobel Prize for saying exactly the opposite thing." If you go through the credentials of Australia’s Federal MP’s, you will see that there are lots of lawyers, plenty of former trade unionists and a great many people who have Economics degrees. The reason for this is that, for a career politician, if you want to understand what the people in Treasury or the Reserve Bank are talking about, you need to understand their robotic jargon, which is essentially what an Economics degree allows. Scottish writer Thomas Carlyle described economics as “the dismal science”. This is wildly inaccurate. Economics is, far from being science, much better described as being an artform. Specifically, it is the art of looking at the world of business and finance and describing it in impenetrably clunky jargon — like gross domestic product, net present value, fiscal imbalance or non-linear demand curves. Economics takes what most people can see quite clearly and then tortuously renames it. Confined to merely being a form of financial cartography – an obsessive mapping of the world of money – economics is a largely harmless practice, which may even result in some slight positive social benefits in the explication of the obvious to those without the ability to make sense of the world around them. Where difficulties tend to arise is when economists use the picture they have drawn to derive and posit economic theories and then use them to predict future economic events, as they always fruitlessly persist in trying to do. It is, of course, entirely natural to want to know what will happen in the future. Unfortunately, economists have an incredibly poor record in this area. 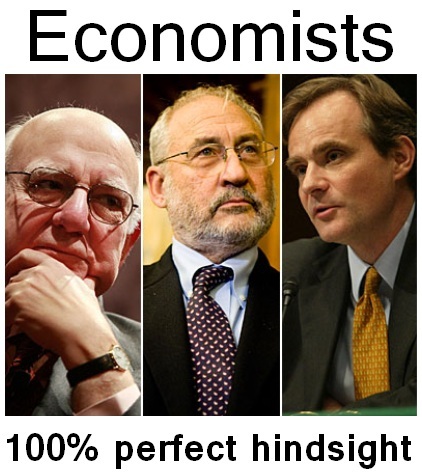 Many people posit that God created economists merely to make weather forecasters look good. The problem with using economics to try to predict the future is that the world of finance is so complicated, economists always need to simplify and make assumptions. The truth is, every single one of us are independent units within the economic system, so unless economists have all our impulses and desires mapped correctly into a monstrous computer simulation, they will never be entirely successful in predicting what may happen next. To overcome this, economists use standard assumptions about human behaviour and the way markets work, such as (amongst others) that people are rational, they are profit maximisers, that markets are efficient and that all participants in the market have access to perfect information. Of course, all those suggestions can immediately be dismissed as arrant, laughable, nonsense. Anyone who has opened their eyes occasionally and blearily looked around at the world knows that human beings are often, if not usually, irrational; do not necessarily put money at the top of their list of motivations or concerns; markets are usually chaotic and work according to some herd-of-lemmings-like instinct and no-one has perfect information about anything at all — ever. Hence economists spend their days futilely tinkering with these and other so-called “neo-classical” economic assumptions to try to create a more meaningful model for the world. For the reasons alluded to before – that is, it will always be grossly imprecise – they are resolutely destined for ever more abject and pathetic failure in their prognostications, except through the occasional intervention of sheer luck. It is true that banks and wealthy financial institutions do occasionally get things right. They do this by building enormous and incredibly detailed models of the world. To construct these models, they usually enlist physicists or mathematicians — and never, ever, economists. The really sinister part about economics is that people in power commonly use economics to develop ideologies. These ideologies are then often used to develop Government policy. Typically in the world's current dominant neo-liberal economic paradigm, this supports calls to remove Government regulation; the reform of industrial relations laws, especially those removing workers entitlements or conditions; or simply to allow unrestrained foreign investment or free trade. The motivations of people attempting to use the art of economics to impose such ideologies must always be examined assiduously, as it will usually be found that economic gain will accrue to the most active proponents of any particular ideology as the direct result of its practical implementation. This is the first in an Independent Australia series looking at common economic furphies and the damage caused by their ardent adherants.